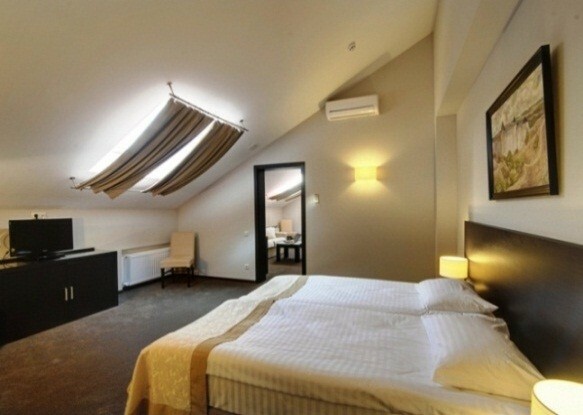 The Reikartz Dnipropetrovsk hotel is located in the business center of the city. It is within easy reach of the railway station and airport. The convenient location also offers guests the opportunity to walk along the picturesque banks of the River Dnipro. The Reikartz Dnipropetrovsk offers not only modern and comfortable rooms, but also the full range of services required by business travelers. Our staff will be happy to provide transfer services, to book tickets and organize business and social events for hotel guests. The hotel features two multi-purpose conference rooms. There is also a restaurant offering a variety of Ukrainian and European dishes, a lobby bar, exercise room, on-street and underground parking areas, laundry facilities. The room comes standard with one single bed (900 x 2000), mini-bar, in-room safe, hairdryer, air conditioning, TV set, satellite TV, Wi-Fi, telephone, desk, luggage cupboard, wardrobe, bathroom with shower cubicle. Each room comes standard with two single beds (900 x 2000) or one double bed (1600 x 2000), mini-bar, in-room safe, hairdryer, air conditioning, TV set, satellite TV, Wi-Fi, telephone, desk, luggage cupboard, wardrobe, bathroom with bath and bidet. Each room comes standard with two single beds (900 x 2000) or one double bed (1600 x 2000), mini-bar, in-room safe, hairdryer, TV set, satellite TV, Wi-Fi, air conditioning, telephone, desk, luggage cupboard, wardrobe, bathroom with bath, bidet, balcony (in some rooms). Each room comes standard with two single beds (900 x 2000) or one double bed (1600 x 2000), mini-bar, in-room safe, hairdryer, TV set, satellite TV, Wi-Fi, air conditioning, telephone, desk, luggage cupboard, wardrobe, sofa and coffee table (in some rooms), bathrobes, bathroom with bath, bidet, balcony (in some rooms). The junior suite comes standard with two single beds (900 x 2000) or one double bed (1600 x 2000), mini-bar, in-room safe, hairdryer, TV set, satellite TV, Wi-Fi, air conditioning, telephone, desk, luggage cupboard, sofa or two armchairs, coffee table, wardrobe, bathrobes, bathroom with bath, bidet. Each suite comes standard with two single beds (900 x 2000) or one double bed (1600 x 2000), mini-bar, in-room safe, hairdryer, TV set, satellite TV, Wi-Fi, air conditioning, telephone, desk, luggage cupboard, sofa or two armchairs, coffee table, wardrobe, bathrobes, bathroom with bath, bidet. Two bedrooms, living room, two bathrooms and guest toilet. The presidential suite comes standard with four single beds (900 x 2000) or two double beds (1600 x 2000), mini-bar, in-room safe, hairdryer, air conditioning, three TV sets, satellite TV, Wi-Fi, telephone, two desks, luggage cupboard, breakfast bar with bar stools, sofa, three armchairs, coffee table, three wardrobes, bathrobes, two bathrooms with bath and bidet, guest toilet, balcony. Room price includes: transfer from the airport/railway station to the hotel and back, mini-bar, daily newspapers and the evening service. A special gift from the hotel – a bottle of Reikartz Cabernet presented in a gift box, a seasonal fruit bowl and sweets. Suite of rooms decorated in the style of Ludovic XIV with classical and baroque detailing. The presidential suite comes standard with four single beds (900 x 2000) or two double beds (1600 x 2000), mini-bar, in-room safe, hairdryer, air conditioning, three TV sets, satellite TV, Wi-Fi, telephone, desk, luggage cupboard, sofa, two armchairs, two pouffes, coffee table, three wardrobes, bathrobes, two bathrooms with bath and bidet, guest toilet, balcony. The Reikartz Dnipropetrovsk offers not only modern and comfortable rooms, but also the full range of services required by business travelers. The hotel staff will be happy to provide transfer services, to book tickets and organize business and social events for hotel guests. The hotel features two multi-purpose conference rooms. There is also a restaurant offering a variety of Ukrainian and European dishes, a lobby bar, exercise room, on-street and underground parking areas, laundry facilities.